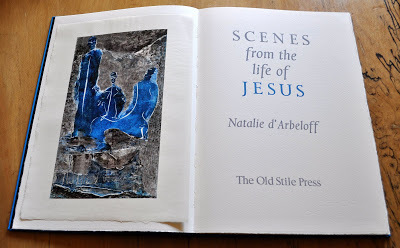 Way back in 1999, we had the great pleasure of helping towards publication Natalie’s amazing vision of The Revelation of Saint John the Divine. 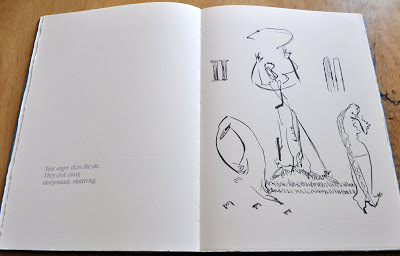 Many people thought it one of the most radical pieces of book production they had ever seen and it was widely exhibited in Libraries and Museums, especially during the year of the Millennium. We have just published another unique book consisting of images by Nd’A and I cannot resist posting some of these here. 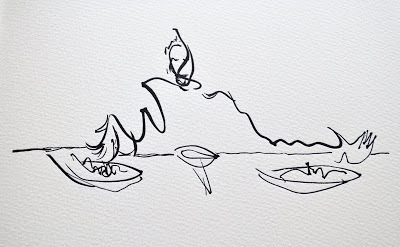 The moment I saw these drawings, I felt that I would love to try to make a book of them. That book is now completed and I am happy with it . 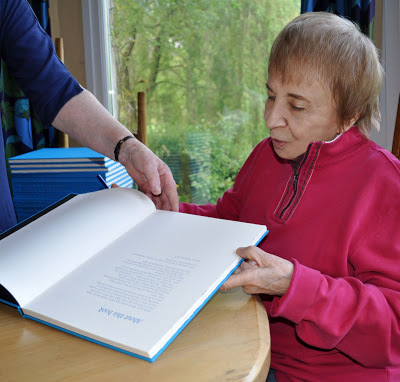 . . and so, I am relieved to say, is Natalie who came to stay with us a couple of days ago to sign the copies – see photographs above and below. The book is of simple layout. 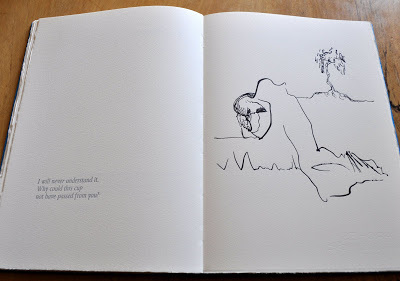 For each of the drawings there are two full page spreads, giving an appropriate title, a Bible quotation and a ‘comment’ by the artist. I have chosen this one of The Last Supper to enlarge here so the extraordinary strength of the ink line can be seen. This is one of my favourites (as is the one above showing Jesus talking to Pilate) but they are all marvellous). We have a pdf about the book which we have just sent out as an email. Please ask if you have not received one. Full details will be on our website . . . as soon as I can get to it! 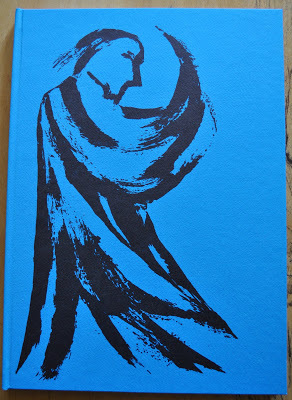 In case of interest, however, the price of the book is £95 plus p&p. Happily it was lovely weather when Natalie arrived so we tried to make the signing not take too long! 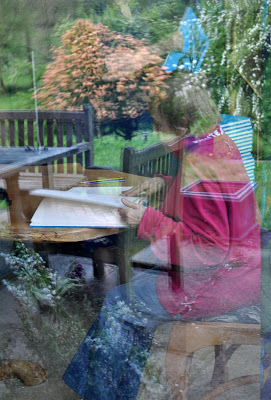 This final photograph mixes elements of signing and nice weather outside . . . taken through the window! Nicolas, I cannot stop looking at the book and being amazed at how you resurrected these early drawings of mine into this stunning new format. And how timely it all is, coinciding with Easter and Spring and the ecstatic flowering of trees all around the Old Stile garden of eden. Back home in London, I'm still seeing that landscape, inner and outer. I cannot thank you and Frances enough. Absolutely fabulous. 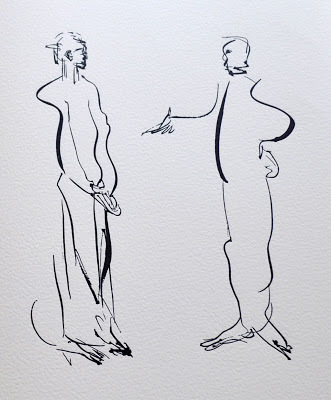 I am thrilled that Old Stile decided to do this book – like you, when i first saw these drawing of Natalie's I was stunned. Can't wait to see it.